I'm crazy about the new Kanban reports. 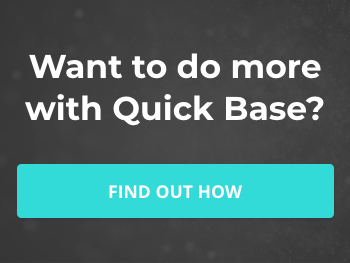 If you've started using them, you may already be looking for features Quick Base hasn't included yet. These hacks will help you get the most out of your Kanban reports while Quick Base works on adding features and capabilities. If you haven't started using Kanban reports yet check out this quick tutorial. Field labels are not included when you add fields to your Kanban cards. For example: In the card below, the 45 refers to the Task ID, but unless you know that there is no way of telling. Option 1: If you need to add a label to just one field, use the Calculated column option. It's located below the card details section. In the formula box, enclose the label you want in quotations (including any punctuation or spacing) followed by an ampersand and then the field. This new field will appear near the bottom of the available columns list with the column label you assigned it. Option 2: If you want to add labels to more than one field, you'll need to create formula text fields for each using the same technique as above in your formula. Now you can easily see that the 45 on the Kanban card refers to the Task ID. 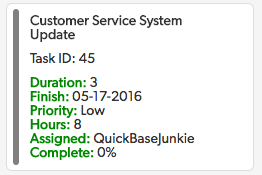 Quick Base currently only allows 3 fields to be added to the Kanban report cards. In many cases, you may want (or need) more than this. I tried several methods to not only get multiple fields into one field 'space,' but to also get the format just right. The best approach I found is using a formula rich text field. 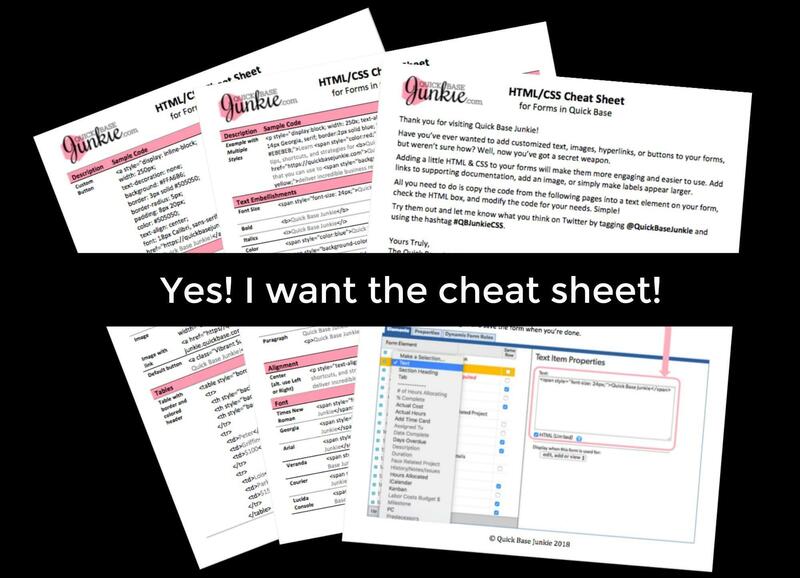 The formula rich text field allows you to use HTML code to format the text. Using the List function with the "<br>" line break between each label/field combo the right formatting was achieved. You can also do other fun things with the HTML like bold the labels or make them another color. Below is the HTML I used to color the labels green to more easily differentiate them from the field values. In the example below I now have 8 fields represented on one card vs. the basic 3 provided by the Kanban report. Include the terminal phases in the card groups. Add a filter to not show records equal to the terminal phase. Now when you move cards into one of these terminal phases, they'll magically disappear from the report. If you found these useful be sure to subscribe to receive more tips like these! 10 groups is a lot. There's a reason Quick Base has set this limit and let's be honest going beyond six columns gets to be a bit unwieldily. If your multiple choice field has more than 10 options, you may want to consider if they are all truly phases, or if some of them are actually status. You don't have 3 phases, you have 1 phase and 3 statuses. You may want to reconsider your design and consolidate your choices. If you absolutely must have more than 10 groups (or even if you need more than 6), consider breaking it into two reports. Create one report for the initial phases and a second for the subsequent phases. It's unlikely that projects will 'jump' multiple phases and you can always duplicate groups like 'on hold' or 'completed' that might be used on both reports. However, this can make seeing the big picture tricky as you'll need to navigate between reports to 'see' all of the cards. This leads us to our last option. This is mostly the same as option 2. However, you now relate all of the records to a parent record (if they aren't already). This allows you to add both reports on the parent record form giving visibility to all of the cards at once. Even so, you still will not be able to move cards between different reports. Okay, this one is a bit tricky. Currently, QuickBase does not allow you to use a related field as the Kanban card group. This may change in a future release. However, there is a way to hack this so that you can still use your related field in combination with a Kanban report. I consider this a more advanced technique since it uses automation. Create a 'faux' related field using a multiple choice field where the choices are based on the related field you want to use. Enter or import the values from the 'real' related field into your 'faux' field. Set up a Quick Base automation to automatically update the 'real' related field every time the 'faux' related field changes. Use the 'faux' related field to build your Kanban report. WARNING: Please be cautious using Quick Base automations and never 'attempt' to use them in a production environment until you've tested and validated them in a test environment first. It is extremely easy to unintentionally trigger an automation that changes records you did not intend on changing. This one may be a little more obvious, but the order of the card groups is based on the order of the choices in the multiple choice field that the groups are based on. So if the choices are set to display in alphabetical order, that's the order they'll appear in. 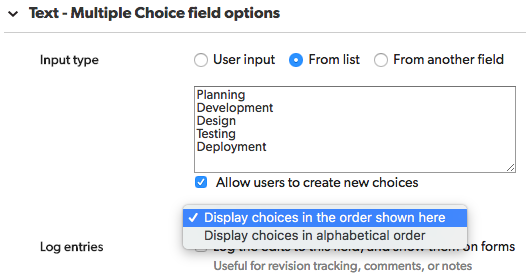 Select "Display choices in the order shown here"
If your multiple choice field happens to be based on another field, you'll need to modify the settings for that field. When initially launched the only option to sort cards within the groups was to use the default sort order in the default sort settings. Note: unlike other report settings you cannot set multiple sort options in the default settings. Select the option in the Kanban report settings to "Sort on other fields"
As described above, the Kanban report does recognize formula rich text fields. 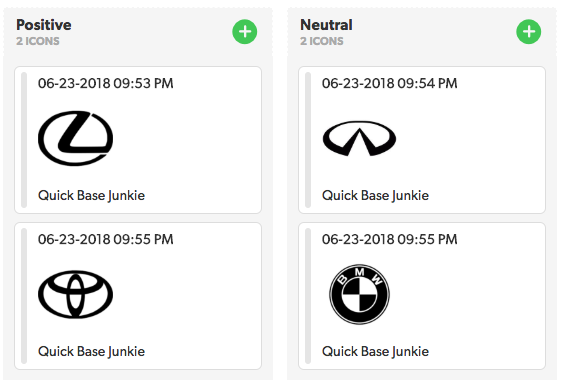 This means that you can add icons, images, emojis, logos, and even user avatars to your Kanban cards. Check out my post on How to use icons to draw focus and drive action in Quick Base to learn more. I've already described above how you can add color with formula rich text fields (#2 & #8), but Quick Base has also provided a built-in capability. Check the box to "Color-code cards using a formula"
For more instruction on color-coding check out my post on Why you should be adding color to your reports. You may have already noticed this, but it's worth repeating. After saving, you are not returned to the Kanban report. This may be a bug and hopefully will be fixed soon.